Dollar sales in November declined by an expected seasonal 12% to $182,673,229 from October’s $206,744,372, up slightly by 1% from last November’s $181,012,718. The 12 month moving average line for total dollar sales continues to move up indicating continued improving market conditions. This is reasonable performance in the winter sales season. Early projections for next year are encouraging; sorry I can’t be more specific yet. Unit sales were off 16% to 995 in November from 1,181 in October, a decrease of 186. This is off 6% from November 2012 at 1,059.This number will increase as late sales are reported. Our ABRE/ACRE Projections for 2013 projected 1,070 sales for November. For November, actual sales for the month were 7% worse than projections and 1% higher than year to date. Please see here for a summary of the projections http://goo.gl/nytW8 and the spreadsheet with details and month by month projections by area http://goo.gl/GEYWa (see the tabs on the bottom). New sales decreased by 27 units to 118 homes this month from 145 in October and are off by 12 from 130 last year. Used sales declined 15% to 877 homes in November from 1,036 last month, a decrease of 159, and up by 52 units from 929 last year(Sect E p.3). This month total inventory is 8% lower than last month at 9,195 vs. 9,951 last year and 10,168 last month. The drop in the current month is caused by month-end expirations which should come back on the market shortly. We are seeing a seasonal downtick in inventory and it is slightly lower than prior years, although New home inventories are beginning to look a bit high. Active New listings decreased to 804 in November from 1,072 in October, a decline of 268 units (Sect E p.3). Housing permits were up in Jefferson County to 122 in October from 86 in September and up from 77 in the year ago period. Shelby County went from 16 to 28 in October. Note that the census dept has caught up to October from the shutdown. Absorption for Used homes in November shows 8 months,one month better than 9 months last year. Used Active listings at 8,385 are lower than the 9,083 last year (Sect E p.3). The number of homes listed in the over $600,000 price range has been climbing somewhat faster than sales, resulting in some upward drift in the months of sales (generally over a year). The market performance is highly area specific, so check the area charts. For instance, Mountain Brook has about three months of inventory except in the over $900,000 category which has 8 months of inventory (29 homes) with four sold in that price range last month . The average days on market for that category is 240 indicating a some older listings are moving. 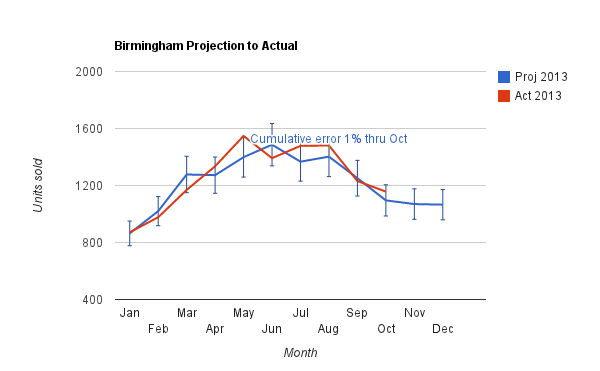 Birmingham area Average Days on Market for New houses is 213 compared to last month at 170. The Used homes DOM was 135 in November, compared with 135 last month (Sect A p.18). NOTE: DOM for Used homes indicates that well priced homes are moving in about 4 months. Average sales price for Sold New homes decreased to $271,066 from $281,859 last month (Sect A p2). Average sales price for Sold Used homes increased to $171,822 from $160,111 last month (Sect A p2). The moving average price for Used Homes has been up steadily for the last year. The 12 month moving average line for New home prices has also been heading up quite nicely since the beginning of the year. Average Home prices, New and Used, are improving (Sect A p2). This entry was posted in Alabama, Birmingham, Building Permit, Construction, Forecast, Jefferson County, Monthly comments, real estate, sales forecast and tagged Absorption, Birmingham, building permits, Days on market, Housing Statistics, Inventory, Jefferson County, Monthly comments, Real estate pricing, Sales, Shelby County on December 16, 2013 by Tom Brander. November sales declined by 16% to $106,952,847 vs. October at $127,291,004. This was off 12% from last year’s $121,727,839. The twelve month moving average line on the total dollar sales chart is heading up. This month’s results were somewhat lower than expectations ( but, within 6%). Total unit sales declined 13% to 691 in November vs. 796 in October, a decrease of 105. This was 4% lower than last year at 722. Our projections for ACRE and Brander Real Estate for 2013 called for 734 sales in November with actual results 6% under that, and year to date volume is 1% lower than our projection. See here http://goo.gl/nytW8 for an article sumarizing the projections. Here is the spreadsheet with month by month projections by area http://goo.gl/GEYWa (see the tabs on the bottom). My preliminary work on next year’s projections is, as yet, indeterminate. New sales increased to 120 this month vs. 143 last month, off 23. Used sales decreased to 571 this month vs. 653 last month, off 82 (Sect E p.3). Inventory levels remain stubbornly high. Used inventory levels remain high this month at 11 months (see the chart Sect C p.1), with the situation continuing to be particularly challenged in the higher price ranges. Used homes over $400,000 have more than two years of inventory. Looking at the overall absorption chart (Sect C p1) it appears that used home inventories (in units) are approaching historical highs. New home absorption is 9 months of inventory overall, and this has been climbing)(E-1). The New Home inventory level in the $300,000-$500,000 is approximately 5-6 months. (Not bad!). August housing permits issued were 85 in October compared with 91 in September (chart on the web site). Note that the census dept has caught up from the shutdown. Total Active listings decreased this month to 9,185 compared to last month’s 9,371, and above last year at this time at 8,437, with the reduction in the current month exaggerated due to month-end expirations. (Sect A p.4 and Sect E p.3). Active New listings decreased to 1,359 this month from 1,543 in October, down 184. (Sect E p.3). Active Used listings decreased to 7,286 this month from 7,828 in October, down 542 and slightly above last year’s amount at this time of 7,167. (Sect E p.3). Average Days on Market for Sold New homes was 157 vs. 155 days last month, with Used at 151 in November compared with 155 in October (Sect A p.18). This entry was posted in Alabama, Building Permit, Huntsville, Monthly comments, North Alabama, real estate, sales forecast, sales projections and tagged Alabama, Days on market, Huntsville, Inventory, Monthly comments, Moving average, October, real estate, Sales, Year-to-date on December 16, 2013 by Tom Brander. Dollar sales in October declined by an expected seasonal 13% to $204,249,088 from September’s $235,332,290, up nicely by 12% from last October’s $181,933,504. The 12 month moving average line for total dollar sales continues to move up indicating continued improving market conditions. This is excellent performance in the fall sales season with no signs of weakness or slowdown. Unit sales were off 6% to 1,157 in October from 1,231 in September, a decrease of 270. This is up 9% from October 2012 at 1,066.This number will increase as late sales are reported. Our ABRE/ACRE Projections for 2013 projected 1,095 sales for October. For October, actual sales for the month were 6% better than projections and 2% higher year to date. 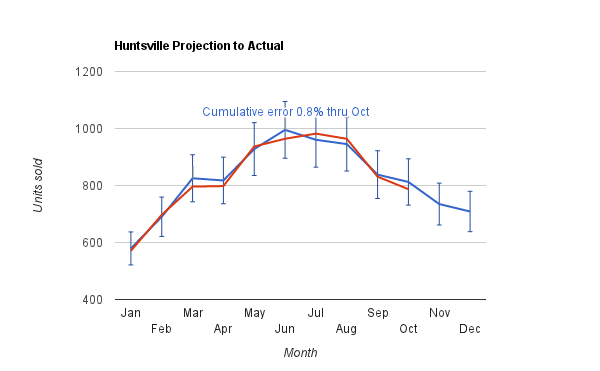 Please see here for a summary of the projections http://goo.gl/nytW8 and the spreadsheet with details and month by month projections by area http://goo.gl/GEYWa (see the tabs on the bottom). New sales decreased by 6 units to 142 homes this month from 148 in September and are up by 16 from 126 last year. Used sales declined 6% to 1,015 homes in October from 1,083 last month, a decrease of 68, and up by 75 units from 940 last year(Sect E p.3). This month total inventory is 8% lower than last month at 9,455 vs. 10,384 last year and 10,237 last month. The drop in the current month is caused by month-end expirations which should come back on the market shortly. While we are seeing a seasonal uptick in inventory it is still lower than prior years, although New home inventories are beginning to look a bit high. Active New listings decreased to 804 in October from 1,072 in September, a decline of 268 units (Sect E p.3). Housing permits were down in Jefferson County to 69 in August from 101 in July. Shelby County went from 32 to 28 in August. Absorption for Used homes in October shows 8 months, two months better than 10 months last year. Used Active listings at 8,651 are lower than the 9,486 last year (Sect E p.3). The number of homes listed in the over $600,000 price range has been climbing somewhat faster than sales, resulting in some upward drift in the months of sales (generally over a year). The market performance is highly area specific, so check the area charts. For instance, Mountain Brook has about four months of inventory except in the over $900,000 category which has 9 months of inventory (28 homes) with one sold in that price range last month . The average days on market for that category is 98 indicating an aggressive market for properly priced homes..
Birmingham area Average Days on Market for New houses is 170 compared to last month at 200. The Used homes DOM was 135 in October, compared with 130 last month (Sect A p.18). NOTE: DOM for Used homes indicates that well priced homes are moving in about 4 months. Average sales price for Sold New homes decreased to $283,004 from $288,372 last month (Sect A p2). Average sales price for Sold Used homes decreased to $161,638 from $177,889 last month (Sect A p2). The moving average price for Used Homes has been up steadily for the last year. The 12 month moving average line for New home prices has also been heading up quite nicely since the beginning of the year. Average Home prices, New and Used, are improving (Sect A p2). This entry was posted in Birmingham, Building Permit, Forecast, Home values, Inventory, Jefferson County, Monthly comments, real estate, sales forecast, sales projections and tagged building permits, Days on market, Inventory, Jefferson County, Monthly comments, October, Real estate pricing on November 19, 2013 by Tom Brander. October sales declined by 11% to $126,349,004 vs. September at $142,710,174. This was off 2% from last year’s $128,656,905. The twelve month moving average line on the total dollar sales chart is heading up. This month’s results were in-line with expectations (within 3%). Total unit sales declined 5% to 787 in October vs. 831 in September, a decrease of 145. This was 1% lower than last year at 794. Our projections for ACRE and Brander Real Estate for 2013 called for 812 sales in October with actual results 3% under that, and year to date volume is 1% lower than our projection. See here http://goo.gl/nytW8 for an article sumarizing the projections. Here is the spreadsheet with month by month projections by area http://goo.gl/GEYWa (see the tabs on the bottom). New sales increased to 143 this month vs. 142 last month, up 1. Used sales decreased to 644 this month vs. 689 last month, off 45 (Sect E p.3). In-spite of increased sales, inventory levels remain stubbornly high. Used inventory levels remain high this month at 11 months (see the chart Sect C p.1), with the situation continuing to be particularly challenged in the higher price ranges. Used homes over $400,000 have more than two years of inventory. Looking at the overall absorption chart (Sect C p1) it appears that used home inventories (in units) are approaching the historical highs, although the months of inventory is not quite as concerning due to the increased sales level. August housing permits issued were 109 compared with 113 in July (chart on the web site). Total Active listings decreased this month to 8,799 compared to last month’s 9,457, and above last year at this time at 8,788, with the reduction in the current month exaggerated due to month-end expirations. (Sect A p.4 and Sect E p.3). Active New listings decreased to 1,326 this month from 1,526 in September, down 200. (Sect E p.3). Active Used listings decreased to 7,473 this month from 7,931 in September, down 458 and slightly above last year’s amount at this time of 7,464. (Sect E p.3). Average Days on Market for Sold New homes was 155 vs. 141 days last month, with Used at 155 in October compared with 156 in September (Sect A p.18). This entry was posted in Absorption, Building Permit, Forecast, Huntsville, Monthly comments and tagged building permits, Days on market, Housing Statistics, Huntsville, Inventory, Monthly comments, North Alabama, real estate on November 19, 2013 by Tom Brander. Sales dollars declined 15% in October to $94,693,836 from September’s $111,182,489. This is 16% above October last year at $81,980,796. (Sect A p.2). This is a strong showing for October, the slower fall season. The 12 month moving average line of sales has continued to point up steadily for three years now. Inventories are slowly trending down. On a unit basis, sales of all houses were down 10% at 415 this month vs. last month at 459, which is up 16% from last year’s 359. In spite of the substantially improved sales climate, it is important to point out that the inventories of homes over $400,000 while improving from really bad levels, remain at over a 12 month supply. Used Home sales declined 6% to 367 this month vs. 389 last month, which is up 13% from last year’s 326 (Sect A p.18). New Home sales were 48 this month vs 70 last month compared with 33 last year. Increasing year over year sales of New Homes is indicative of a recovering market. New listings for New homes decreased to 82 from 94 in September. Used homes New listings decreased to 594 from 606 in September with net inventory down. The absolute number of Used Active homes on the market, which had a slight peak mid-summer of ‘09, has once again been improving. In October, there were 3,430 Active Used homes, a reduction from 3,910 in September. The New home market, which peaked in October 2006 at 2,144 Active, now sits at 416. The Absorption rate for New homes was 9 months of inventory for October vs. 10 in September. The Absorption rate for Used homes was 9 months of inventory for October vs. 10 in September. Over the last four years the drop in months of inventory for Used homes has been steady and impressive from 25 months plus in October 2008 to 9 months this October. As I observe above though, the inventory of homes remains high. Average sales price for all homes have been improving modestly for the past year. For New units, prices decreased to $357,428 from $357,864 last month. (Sect A p.14). Average Used home prices decreased to $211,273 from $221,419 in September. The price trend is up for the year. Average Days On Market for New Sold properties in October was 117 this month vs. 161 last month. Days On Market for Used was 172 this month vs. 165 last month. We see improvement in the second home market, which is needed for the coastal area to gain strength. While there is still a lot of inventory particularly in the upper price ranges, sales are continuing to improve. The situation on the coast remains quite positive. This entry was posted in Alabama Coast, Baldwin, Home values, Monthly comments, real estate and tagged Alabama, Alabama Coast, Baldwin County Alabama, Housing Statistics, Inventory, Monthly comments, October, Real estate pricing on November 19, 2013 by Tom Brander. September sales declined by 12% to $139,568,716 vs. August at $159,339,428. This was up 16% from last year’s $120,579,612. The twelve month moving average line on the total dollar sales chart is heading up. This months’ results were in-line with expectations (within 3%). Total unit sales declined 15% to 816 in September vs. 961 in August, a decrease of 145. This was 10% higher than last year at 740. (it is worth noting that we again had a larger number of past month’s reported sales than usual, resulting in changes in historical adjustments). Our projections for ACRE and Brander Real Estate for 2013 called for 938 sales in September with actual results 3% under that, and year to date volume is 0.8% lower than our projection. See here http://goo.gl/nytW8 for an article sumarizing the projections. Here is the spreadsheet with month by month projections by area http://goo.gl/GEYWa (see the tabs on the bottom). New sales decreased to 135 this month vs. 165 last month, down 30. Used sales decreased to 681 this month vs. 796 last month, off 115 (Sect E p.3). Due to the Government shutdown we cannot report on number of housing permits issued (chart on the web site). Total Active listings decreased this month to 8,838 compared to last month’s 9,424, and below last year at this time at 8,935, with the reduction exaggerated due to month-end expirations. (Sect A p.4 and Sect E p.3). Active New listings decreased from 1,410 last month to 1,284 in September, down 126. (Sect E p.3). Active Used listings decreased from 8,014 last month to 7,554 this month, down 46 and slightly below last year’s amount at this time of 7,647. (Sect E p.3). Average Days on Market for Sold New homes was 141 vs. 144 days last month, with Used at 156 in September compared with 144 in August (Sect A p.18). This entry was posted in Absorption, Alabama Real Estate Confidence Index, Building Permit, Construction, Forecast, Huntsville, Monthly comments, North Alabama, real estate, sales forecast, sales projections, Shelby County and tagged Alabama, Brander Real Estate, Days on market, Huntsville, Inventory, Monthly comments, North Alabama, real estate, September on October 14, 2013 by Tom Brander. Sales dollars declined 17% in September to $101,878,090 from August’s $122,637,528. This is 26% above September last year at $80,536,696. (Sect A p.2). This is a strong showing for September, early in the slower fall season. The 12 month moving average line of sales has continued to point up steadily for three years now. Inventories are slowly trending down. On a unit basis, sales of all houses were down 18% at 439 this month vs. last month at 536, which is up 22% from last year’s 359. In spite of the substantially improved sales climate, it is important to point out that the inventories of homes over $400,000 while improving from really bad levels, remain at over a 12 month supply. Used Home sales declined 19% to 385 this month vs. 475 last month, which is up 21% from last year’s 318 (Sect A p.18). New Home sales were 54 this month vs 61 last month compared with 41 last year. Increasing year over year sales of New Homes is indicative of a recovering market. New listings for New homes increased to 73 from 71 in August. Used homes New listings decreased to 600 from 631 in August with net inventory down. The absolute number of Used Active homes on the market, which had a slight peak mid-summer of ‘09, has once again been improving. In September, there were 3,516 Active Used homes, a reduction from 3,945 in August. The New home market, which peaked in September 2006 at 2,144 Active, now sits at 383. The Absorption rate for New homes was 9 months of inventory for September vs. 10 in August. The Absorption rate for Used homes was 9 months of inventory for September vs. 10 in August. Over the last four years the drop in months of inventory for Used homes has been steady and impressive from 25 months plus in September 2008 to 9 months this September. As I observe above though, the inventory of homes remains high. Average sales price for all homes have been improving modestly for the past year. For New units, prices increased to $310,899 from $242,446 last month. (Sect A p.14). Average Used home prices decreased to $221,012 from $227,049 in August. The price trend is up for the year. Average Days On Market for New Sold properties in September was 161 this month vs. 180 last month. Days On Market for Used was 165 this month vs. 150 last month. We see improvement in the second home market, which is needed for the coastal area to gain strength. While there is still a lot of inventory particularly in the upper price ranges, sales are continuing to improve. The situation on the coast has turned quite positive. This entry was posted in Alabama Coast, Home values, Inventory, Monthly comments, real estate and tagged Absorption, Alabama, Baldwin County, Inventory, Monthly comments, Real estate pricing, September on October 14, 2013 by Tom Brander.